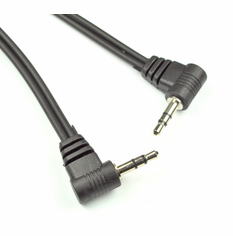 3.5mm Stereo Audio Cables are specifically designed for quality computer and audio applications. The 3.5mm cable connects a PC sound card, portable CD player or any mini-stereo audio device with 3.5mm jacks to multimedia speakers. The cable features two copper conductors and a drain wire. Durable and works well.. Love he angled plugs..
For my purposes, they are absolutely perfect. I am connecting between two pieces of radio equipment and normal plugs interfere with the operation of the equipment. These work fine, and seem to be well made. ProsPerfect fit for my application. I wouldn't have guessed this is so inexpensive. The cable is two jacketed cords fused together, and the plugs even feel solid. Wish I got 2. Great doing business with. Great product with quick shipping. Wonderful pricing. Works great, no noise or static. Great price , prompt delivery, good quality. Only the described length dimension fell short; by 4 inches. But even at 32 inches, rather than 3 feet, the cable "fit the bill" (barely) . 3 feet would have made 5 stars. Pros price , prompt delivery, good quality. I could't believe these were being sold here for less than a buck! The last time I bought one locally, it cost at least five. These are good quality, though I can't speak for their longevity, as we just got the order. The right angle cable is excellent for the Aux input in my Toyota Yaris. The Aux input is near the emergency brake in the center console, so a regular straight cable kept getting hit. The right angle cable is nice and low profile, so it stays out of the way, and has a great fit. A local shop had a virtually identical cable for sale - at a price that was more than twice the price (including shipping) of this cable. I was pleased that the shipping was exceptionally fast as well. All in all, a very good deal. ProsExactly what I needed at a very good price. Great service, great cable and excelllent delivery price. End of story! ConsI will be using one of my cables on motorcycle, so it would be nice if one end had a weather shield on the cable to keep rain out of the aux port. The cable was exactly what I was looking for at a price I couldn't believe. Great Audio. Would highly recomend them ..
ProsRight angle ends for tight places. Used these cables to connect older style serial port voice modems to computer systems. The 90 degree stereo connector fits perfectly and reduces the amount of space needed on the side of the modem. ProsVery high quality materials used. I thought I ordered one but I guess I put 2 down. Oh well at $0.99 you really can't go wrong having an extra one lying around. I've used it for quite a few things. Works perfectly for my car stereos front aux adapter into my Droid X. The price is right and quality is good. I have had no problems with this cable. The sound quality is good and the right angle connection looks neater in my vehicles. ProsHeayv duty with low profile, right angle plug. Purchased these to connect to a motorcycle helmet. With the slightest head movement the connector moves and the connection is lost. They were cheap, but don't work. I had a cable from Wallie world as backup and it worked fine. I needed to get a couple of audio cables for the stereos in my car and SUV. I shopped around on line and all the run of the mill electronics stores wanted a minimum of $9.99 for similar cables. I picked up these cables and they are higher quality (thicker, more durable cables) and with the sale price I got they ended up being about 10% of the cost from the big stores. Thank you for the great value and quality! ProsHigh quality cable and a great price! Excellent product, Quick Shipping, Right Price. Hard to find item. These guys shipped it lightning fast. I received it the next day. I've been using the cable for a couple of weeks now and the sound quality is the same as any I've ever used. The product itself appears well made. Nice, tight, solid connectors. You would pay 5-10 times this price for the same at one of the big box stores. Bought two of these to connect iPods to my cars. One is a '09 Chrysler 300 where the AUX jack sticks right out of the front of the radio and the right angle connector keeps the cable out of the way. The other car is a '06 Mercedes E-class and the AUX jack is inside the glove box. There's not much space for the plug and the glove box door puts strain on the wire with a straight connector, so a right-angle connector is perfect. Pros+ Good strain relief and thick insulation will make it harder to break wires. + Right angle connectors will help keep the connectors from sticking out where they get bumped and broken. + 3ft lenght helps reduce cable clutter where longer cable isn't needed. Cons- Not shielded, according to PCH. - Available only in 3ft and 6ft lenghts. I looked all over and no one had the 90 degree plugs. Finally found it at the right price with PCH. Best price. Cheaper than the shipping. Works great. This is the 2nd time I've bought these, this time for a friend connecting his ipod to his new Tundra, he's very happy with the deal considering they were $20 ea at BB! I picked up 2 for him and a backup for myself, have had no probs with the 1st one I bought for my Jeep in Dec 07. Quality is acceptable, great buy! Good strain relief, welll made, perfect for the job. Superior quality, super fast shipping, lowest price. Why say more! Bought this cable to run my Sirius thru my new car radio. It's exactly what I needed, at less than 1/2 the price of comeptitors (including shipping!). It appears to be a good semi heavy duty cable, will work with the application that I am attempting to utilize it for. That said, it would be nice to be able to get the same cable ends on a shorter cable. 1.5' to 2'. The audio cables arrived in a very short time. The quality is good, and right angle connectors are sometimes hard to find. I would recommend PCH Cables to anyone. Great price on a hard to find right angle audio cable. My husband sent me on a quest to locate right angle (both ends) 3.5mm stereo audio cables. This was a real mission. After finding what he wanted at PCH Cables, I bought this cable. This cable was very affordable and made well. This isn't our first time dealing with PCH Cables. We are impressed with the quality of all the cables we have gotten from them in recent months. I highly recommend you giving this a try and PCH Cables! I'd looked for affordable cables with angled ends. I found them at PCH Cables and was quite happy with the quality, price and fast shipping. Thank you! Will look to use you again. This cable works well with satellite radio receivers and front aux inputs on car stereo. This cables works great and I like they quality. I was trying to find angle on just one end, but this work well. I spent hours trying to find a stereo cable with two right angle ends. This one does, the quality is pretty good and the price is cheap. PCH cables was *awesome* and got my order to me very fast. Makes a much nicer fit/ appearance over the straight style (Radio Shack only had this type in white and for twice the total cost). The quality is a question mark, the connectors seem to be a little funky but so far have worked good. Used for a direct connection for Sirius Radio in my Jeep. Would buy again. This fits my car great with the right angle (less likely to break off radio plug) and shorter length. However there is something crackly/noisy when I move the jack around that my earlier best buy cable did not have so I assume it's bad connections inside the cable or lower quality metal on the jack tip. If I bracket it to the car stereo, so far it's working most of the time.